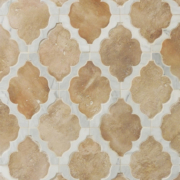 Tabarka Studio has been handcrafting custom terracotta tile one piece at a time since 2000. Their handmade terracotta tiles are inspired by cultures worldwide and embody artisan craftsmanship and beauty. They have established a reputation as a leading producer of custom hand painted terra-cotta tiles and have grown to be a bespoke collection of stones, terracottas, antique elements, hand painted tiles and wood and parquet collection. New Ravenna is America’s premier designer and manufacturer of stone and glass mosaic tiles for both residential and commercial installations. The company’s products are handcrafted mosaics that are fashioned into decorative borders, murals, field tile and medallions. Tile is cut and can be tumbled, honed, or treated to create distinctive styles, subtle shade variations, and textures. The end result is a custom, one-of-a-kind work of art in mosaic tile, which often incorporates the designs of architects, interior designers and their clients.